I have two cassettes at home. One is a split in which my band is featured; the other is some album by a Japanese group. I never heard any of them, as I do not own anything that can play cassettes. Well then, armed with an mp3 version of this little split between Canadian/French .cut (DotCut) and Fragment, a fellow French artist, I sat and listened to what they have to say. I like Mp3 even less than cassettes, but at least I can listen to these files. So we have the cover art, displaying a distorted picture of an image that only resembles a volcanic eruption by now. As I watch these liquid flames, Fragment. emerge from the speakers, with a soft, polite melody that sounds like a memorial anthem played as a slow dirge. After about a minute, “Everything comes to an end” blasts into a bombastic, dramatic and wonderful song. Fragment. manages to sound both uplifting and somber, with clean vocals that emerge from the unforgettable music. Heavy drums, delicate, yet demanding guitar and constant, but welcoming distortion, are the elements in this volcanic, sublime piece. “Everything comes to an end” is riding on the highest waves of distorted, yet romantic Post rock, resulting in a catchy anthem for the end times. Following the 15 minutes of Fragments track, .cut and Gibet offer their own fifteen minutes, in the form of the track “Je Suis (L’Ange Exterminateur) “. Beginning with the alienated sounds of an ethereal guitar, the track slowly gives way to a long speech that serves as the safe center in the sad, haunting music of the duo. As the voice talks about enemies, a ticking clock appears, floating in the darkness of space that is painted by .cut and Gibet. The ticking, hinting the fact that this track is going to stay slow and steady, makes it even more haunting. It is not the possible surprise that is lurking in the shadows for the listener that will make that listener uneasy. Instead, it is the constant footsteps in his direction, never stopping, never slowing. 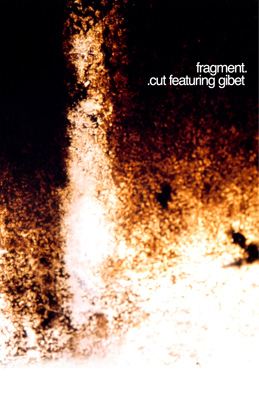 .cut and Gibet know this, and so they are coming for us at a constant pace, as we just sit helplessly, surrounded by the bleak music they are making. Lasting together for thirty minutes, “Everything comes to an end” works really well with “Je Suis (L’Ange Exterminateur)” and so is making this split really worthwhile. While Fragment promises an end, in its spiritual way, .cut and Gibet show a vision of this possible end in a darker manner. This two conceptual opposites result in a touching and fascinating album that is a rewarding and recommended experience, as long as you have a tape to play it with!